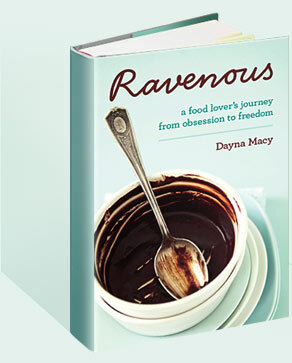 2015 February — Dayna Macy, author of "Ravenous"
It’s been a while. Some friends and extended family members are ill, so I haven’t had as much time as I like to update my blog. One thing I have been doing a lot of is making soup. It nourishes people and makes them happy. And it makes me happy to cook it. 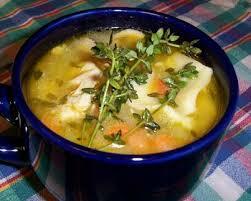 Here’s my Chicken Soup recipe from Ravenous. It’s really delicious. And the kombu (which you fish out before serving) adds much needed minerals to the broth. Place chicken in large stock pot with chicken stock, onion, kombu (if using), garlic cloves, and bay leaf. Bring to a simmer over high heat, skimming any scum that floats to the surface. Add 1 tsp. kosher salt. Reduce heat to medium-low, and simmer soup for 2 hours. Remove chicken from pot and set aside to cool. Strain stock and return to the pot with carrots, celery, and turmeric. Bring to a simmer over high heat. Reduce heat to medium-low, cover, and cook for 30 minutes, or until vegetables are tender. Discard the skin from chicken and remove the meat from the bones. Shred or chop the meat, then add it back into the pot. Taste, and if the soup needs more flavoring, add more salt and cracked pepper to taste. Raise heat to medium and bring soup back up to a gentle simmer. When done, serve in bowls topped with freshly chopped dill. Can serve with noodles or matzoh balls if you like.